Stay in the EU and the UK’s population could rise to 80m people, claim those campaigning for Brexit. But looking at all the evidence and projections, it is highly unlikely that this will happen. And even if it does, I’m not sure it’s a problem. The latest population projections released by the Office for National Statistics (ONS) in October 2015 showed that the UK population is projected to increase by 9.7m over the next 25 years, from an estimated 64.6m in mid-2014 to 74m in mid-2039. Around half of this growth is projected to come from natural increases (an excess of births over deaths) and the other half from positive net migration – more people arriving in the UK than leaving. But leave campaigners have suggested that this population growth might be underestimated, and the UK population could reach nearly 80m, fuelled by high levels of migration. Projecting the future is an inexact science. It involves making assumptions around the three key components of population change: fertility, mortality and migration. So, recognising that projections are uncertain and become increasingly so the further forward in time we go, the ONS also produces a range of alternative scenarios, as the graph below shows. The most extreme of these – where we assume that fertility, life expectancy and migration all rise significantly – results in a population of 79.1m by 2039. But how realistic is this? First, it assumes that the number of children a woman would have, on average, over her reproductive lifetime will rise to 2.09. The last time the UK experienced fertility rates at that level was in the 1960s. Bearing in mind that this is the average, and a growing proportion of couples are choosing to have one or no children, for total fertility to rise to 2.09 means that more families will need to have three, four or even more children. Most family demographers suggest, however, that fertility will remain stable or even fall as more women stay in education and then work full-time. It is also important to remember that fertility levels in the EU countries accounting for the major flows of migrants, such as Poland, are currently lower than in the UK. So the argument that the higher fertility of migrants will drive up average UK fertility is not clear cut. The 80m figure also assumes the rate of mortality will improve by 2.4% a year until 2030, twice the level of improvement in the ONS’s principal projection. This means average life expectancy at birth in the UK will be 86 for men and 88.7 years for women. Although there have been dramatic improvements in life expectancy over the past century as a result of changes in living standards and improvements in medical treatments, many commentators now think that the rate of improvement is slowing down. The longer-term impact of factors such as increased air pollution and rising obesity is, however, difficult to assess. In determining the assumptions used in its projections, the ONS assembled a panel of leading experts: their view was that an improvement in mortality of 1.2% was the most realistic. Finally, the figure of 80m also assumes higher migration than the ONS’s principal projection, with long-term annual net international migration of 265,000 a year instead of the central assumption of 185,000. 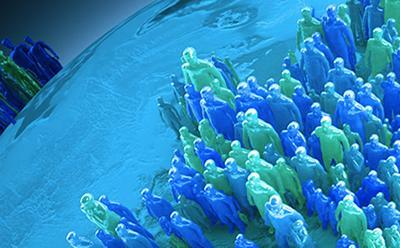 Of all the three components of population change, migration is the most difficult to predict. Recognising this, the ONS commissioned a review of its methodology and the latest projections include new estimates of long-term migration. It’s difficult to say what will happen in 25 years. If we wound the clock back to 1990 we certainly would have not have predicted the last 25 years. But again, many commentators think that the current flows will stabilise and may even reverse. A frequent argument against further population growth is that Britain is full. The evidence for this, however, is not incontrovertible. According to the latest estimates from the Population Division of the UN Department of Economic and Social Affairs, the population density of the world is estimated at around 56.5 people per km². In the UK, it is currently around 267.5 people per km², so compared with the global average you might argue that Britain is indeed “full”. But we need to remember that there are significant areas of the world that are very sparsely inhabited: in Mongolia, population density is just under two people per km². As the graph below shows, there are other countries where people live in very close proximity – the country with the highest population density is actually in Europe, where Monaco has 25,322 inhabitants per km². If the UK’s population were to grow from its current 64m to 80m, this would definitely increase our population density but we would still be below that of some of our European neighbours including the Netherlands and Belgium. A high population density is also not necessarily a problem if the growth is properly planned for, with essential services such as housing made available. We may not wish to live in high-rise Singapore, but in reality, such high-density urban living is very efficient in terms of resources. It is the concentration of people in towns over the last 200 years that facilitated the industrial and then the technological revolutions. Population growth also increases the supply of both workers and consumers, and over the long run, economic historians have found a positive link between the two. Rapid population growth can, however, present problems in the short-term if economic productivity or the supply of education and health care fails to keep pace. So population size per se is not the problem – it is how we deal with it.